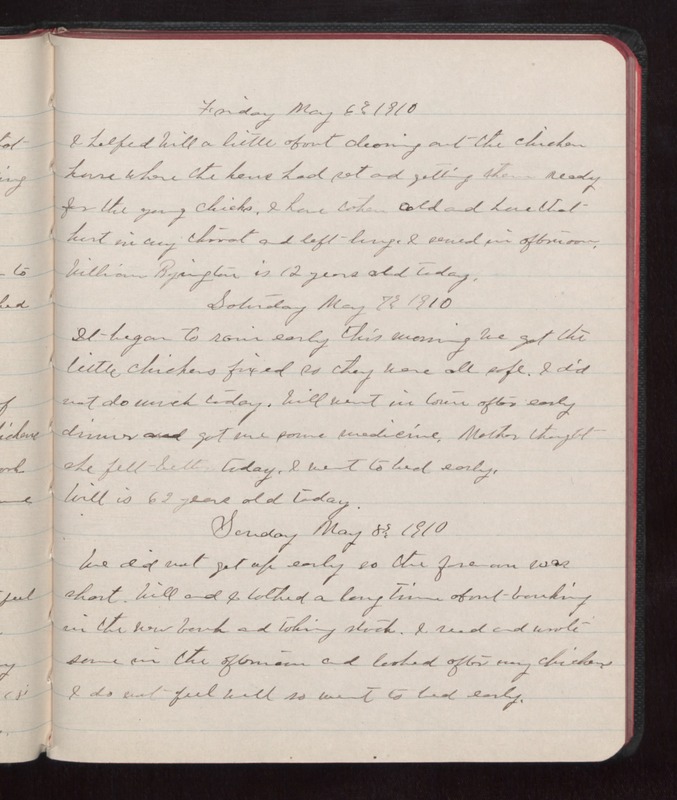 Friday May 6 1910 I helped Will a little about cleaning out the chicken house where the hens had set and getting them ready for the young chicks. I have taken cold and have that hurt in my [chest?] and left lung. I sewed in afternoon. William Byington is 12 years old today. Saturday May 7 1910 It began to rain early this morning we got the little chickens fixed so they were all safe. I did not do much today. Will went in town after early dinner and got me some medicine. Mother thought she felt better today. I went to bed early. Will is 62 years old today. Sunday May 8 1910 We did not get up early so the forenoon was short. Will and I talked a long time about banking in the new bank and taking stock. I read and wrote some in the afternoon and looked after my chickens I do not feel well so went to bed early.